µGUI is a free and open source graphic library for embedded systems. It is platform-independent and can be easily ported to almost any microcontroller system. As long as the display is capable of showing graphics, µGUI is not restricted to a certain display technology. Therefore, display technologies such as LCD, TFT, E-Paper, LED or OLED are supported. The whole module consists of two files: ugui.c and ugui.h. a C-function which is able to control pixels of the target display. integer types for the target platform have to be adjusted in ugui.h. I've spent a lot of time writing µGUI. If you like this project, please support it! I’m quite sure that there is something wrong with your mapping. Have you selected monochrome mode or grayscale mode? Maybe page 18/19 of the datasheet helps you? Which display do you use? Hi! Were you able to get 3 pixels per byte? Hi! I have the same problem with the pixels. Could you show me a example about the use of the "Read Modify Write" function to write 3 pixels per byte?. I did not understand this command on the datasheet. When this command is enabled, is it necessary to do the algorithm on the diagram at page 37 of the datasheet every time when i want write data to the display? Or is it only necessary one time on the initialization process? I find this library somewhat intriging. Do you have any working Arduino examples, and if it is not asking too much – something for a SSD1322 based display? Is your youtube video https://www.youtube.com/watch?v=0aLbv2_fo08 using this library? µGUI does not officially support Arduino so far. I’ll keep you updated regarding Arduino-related examples. Can you provide code for the dsPic33 with the SSD1322 driver? That is the exact setup I am trying to run for a project of mine. I am using the Blue Display. Thank you so much!!!! As we're already talking Microchip, what would be necessary to get a Pic32MZ2048ECH144 and HX8238-A based display to use µGUI? Another significant improvement to the framework would be adding events from windows (you seem to do this according to a TODO comment in the code). If one want to extend window look he/she needs something like OnRender event to draw when window is updated. I really like the design of your code. I was able to get it up and running on a PSOC5 with no problems on a 128×64 newhaven display in so little time I was surprised! Your display has 128×64 pixels, right? Just pretend it has 64×128, use UG_Init(…64,128…) and you get a rotation by 90 degree. Of course you have to swap x and y INSIDE your pset function. Do you have a sample project you could share for PSoC5? does this work with I2C interface? Can you post example code for PSOC? I was wondering if you could please provide some example code interfacing with the Raspberry Pi and 1.5" OLED – SSD1351. I'm also interested in getting a 1.5" OLED SSD1351 running on a Raspberry Pi 2 Model B. In fact, I want to run 3 displays from that Pi (without exhausting the GPIO either–it'll be running 3 sensors too). I have some resources where I work, but any other help you can give would be much appreciated! Interesting project – please share some more details on the forum! I would use SPI for all OLEDs. µGUI is ideally suited to handle all of them in parallel! At the forum you will find an example for the SSD1351! However, i´m not a great GUI designer. I just have a RTOS project and i would like to disseminate the use of such a great tool for embedded software development. Even, i developed a demo based in your code using RTOS services. Doing that i realized a excessive CPU usage for the touch screen reading (like 10%). I just raised the I2C clock to 250khz, droping the CPU usage for less than 1%. If you are interested, i can send you my modified project in order to you evaluate if its possible to implement such event handler mechanism. Nice work with the library. I see on the youtube channel that you used it with 7 inch tft (both uGUI and STemWin). Is there a chance to share the source code ? I've got a problem with the refresh rate. Some times a flicker line appear on the middle of the screen. The flicker will occurs rarely if I lower the PCLK to 16MHz, but it still appears. First, I want to thank you for this library. I've used 0.2 version successfully with an OLED with SSD1322 controller on PIC32. Are the window and button functions work on OLED? I haven't had success with the example code. 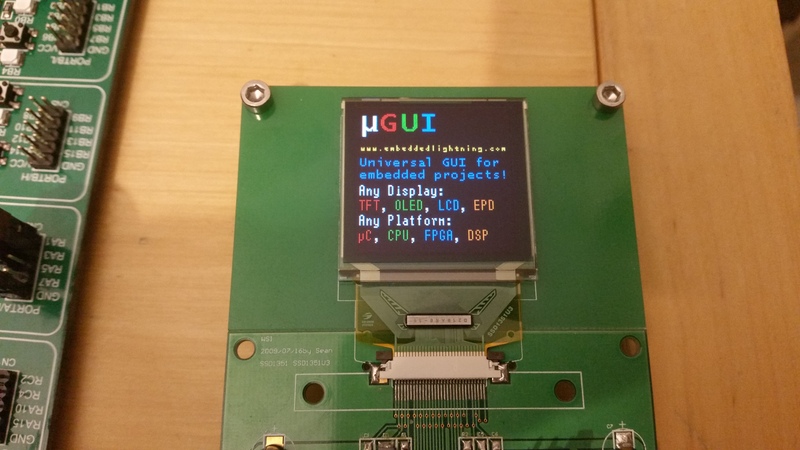 yes, µGUI v0.3 works perfectly fine on OLEDs! Could you share some pictures and your source code on the forum? before everything i want to thank you so much for the outstanding library! I'm using an "ER-TFT070-4" from BuyDisplay 7" with OTA7001A Driver, no init code, just a DPI interface to be used with LTDC interface. Starting with your example of uGFX 3.0 on Stm32f429-Discovery (embd LCD removed) i have changed only screen dimensions to the ltdc.h in order to make it all work and so on it's a really good result. The problem is that i don't understand what THB, THS, THF, TVS, TVB, TVF means and what i have to use in order to optimize a little bit my code.. can you suggest me about that, or maybe a "programmers note" where it's all explained? Thank you so much, and sorry but i'm nearly new to program things with this complexity. PS. if you want i can send you my entire project, i'm aslo using Coocox IDE!! Your Library is my best tutorial. Thank you. I have some question about images. 1.If i want to use an images for a button. 2.Can i put an images on the button?? I’m glad that you like µGUI. µGUI v0.4 will be able to do that! I am having trouble setting the STM32F429 (discovery) to use a larger display. Can you please send me your initialization code of your 800×480 display? there will be soon a related topic on the forum. Please also have a look at the example projects! sure, which display do you use? Please upload the spec on the forum. Can I use ugui with STM32F4-Discovery + ssd1963 fsmc module? I have ssd1963 library. I can run the screen but do not know how I could combine seamlessly with ugui. Can you help with this? please have a look at my example projects. Can you provide code for the MSP430 with the SSD1322 driver? I can't understand how can i use your library. Pleas help me! at the forum you will find an example for the SSD1322! Would it be posisble to get the drivers you used for the demo of the SSD1322 chipset? Hi there i am after a oled display for a pure evoke flow radio and have been told it is a pmo 19301 and is 2.7" diagonaly my question is do you know where i can buy one of these units. please upload pictures of this OLED on the forum, so that we can have a look at it. Do you have any plan to make uGui support unicode? Nice job on the uGUI! I'm currently experimenting with it, I had an stm32f429 discovery board so could start right away with your example project in CoIDE. I drew a window because I need some buttons. However I also need some rectangles so I drew 2 of them with the intention to draw them on top of my main window. This clearly does not work… What I try to do is have 2 measured values shown in those rectangles (voltage and current), all on top of the window. So I need a window, with buttons to push but also 2 areas on the window to show some measured values. Can you give me a hint how to do it or do you have somewhere an example? you could use a textbox and UG_TextboxSetText() function. I hope this helps. Please post further questions on the forum. How can I get the example code source on the youtube and the dirve library of the LCDs. please refer to my examples on this website or have a look at the forum. Would it be possible to get a copy of your low level driver for the ST75256 LCD Controller Chip, please? I think I have an example. Please have a look at the forum in a few days! I'm sorry but I couldn't find them in the forum? Where should I be looking? Could you possibly put all of your example PSET function up on GIT with the source code. I am specifically looking for the ST75256 driver (there is a youtube video of this) and the uc1618T (I haven't seen any support for this chipset). Thank you for your efforts, they are appreciated. I was wondering if I can use this library to get SSD1322 work with xmegaA3AU ? Can you help with some sample code, that would be great! Looking forward to your reply. I have added a example pset function for the SSD1322 driver on my forum! Please use a correct initialization sequence for your display! We are using Tiny6410 stamp module. It is restricted to using only friendlyarm display. We need to interface resistive touchscreen display of 5 inch & 7 inch of our choice. Please give steps how we can use your library. The STMPE811 is ideally suited for resistive touchscreens. Please refer to the forum for further details. Hi Achim, can you tell me what connector you use in your Board lcd 0.96 ssd1306. I use a 0.5mm connector from OMRON. Please refer to the forum for further details. µGUI has already been used on hundreds of displays (some examples: https://www.youtube.com/playlist?list=PLn9k3eL_sqV1Y1FwUu0qFC6u7m6rQe9_V). Yes, it can be easily used for GLCD! Nice work! So impressive!I am new to OLED and now working a project using a NHD-3.12-25664UCB2 OLED with PIC, can u give me an pic code example with the SSD1322 driver? Thanks a lot in advance! Hi, have a look at the forum. There is an example Pset function for the SSD1322. i really wonder about your gui. it is very simple to use. i want to draw a image on my lcd. i also done by using your library with given example image. now i want to convert image to header file. can you suggest any software to do that. I have a small display with no touchscreen. However I want to use windows with GUI buttons and use up/down buttons (physical buttons) to select GUI buttons on the screen (and use an enter button to simulate pressing a GUI button). Is it possible to do this with ugui, to select GUI buttons and generate GUI button clicks programmatically without toutchscreen? Is there a sample project for STM32f7xx-Discovery also available? Is the display an touch screen of the STM32f7-Discovery supported? Yes, uGUI supports any touch and any display. well, this is my first time using STM. i'm using stm32f407 by the way. i really want to use ugui with my stm and ssd1289. do you have any project example that i can use as refrence? it would be really helpful. thanks! I need to use your UGUI with ATMEGA AVR & 7" ER-TFT070-4 TFT LCD in 16it parallel mode. Kindly share any example so that i can use your Ugui with my compiler. I am using CodevisionAVR. Does uGUI support Anti-Aliasing? How to use Anti-Aliasing? Super nice library. It's very well coded and easy to use. I've began developing on it a couple of days ago and will probably go with your library for the rest of my project. 1) Prepare peripherals for data transfer. 2) Setup X start, Y start, X end and Y end according to the bitmap size and position. 3) Use a pointer to the bitmap array and increment the pointer after each color sent. This allows you to write the whole bitmap in one shot with all the right colors (you don't have to write it pixel by pixel). With this in mind, I believe it would be fairly easy to add a supported hardware driver to be used by the drapBMP() function. thank you very much for the feedback! Good idea! There will be some more new acceleration functions available in 0.4…Please post your project at the forum! produces two prallel lines, while they should intersect. Is there something I'm doing wrong, or it just doesn't work this way? These conditions swaps the endpoints of a line. yes, it’s a bug! It will be removed in the next version! Any chance this could be ported to the Teensy (3.2) with the ILI9341? I could probably give it a go to see if I can get it working, but unsure how to do this exaclty as it's a bit out reach for me at the moment. I am working on TI-AM4379 processor with Fema GM12864D-27-O3CY OLED which has SSD1325. Can I use uGUI ? hello. thanks for your good library . I want to use Farsi font . can you help me ? Hi there, if this is a TrueType font, a font converter is available on GitHub. I dont see them send data for LCD from microchip. Will you please share source code for OTA7001A (7" lcd ER-TFT070-4 from buydisplay) Driver for Stm32f429-Discovery and uGFX 3.0. ? Hello Achim Döbler, thank you very much for your library, how can i used your libary with st75256 controler ? do i need to write first the driver ? can you help me please about that ? Thank you very much i'm waiting your help. I need ssd1963 library for int070atft-TS for dsPIC33FJ256GP710-I/PF controller. Can some one provide me? What is its license? Can I use it in commercial products, please? Oh, I see. I will plan to test it in my prototype. Thank you for your great project! I am trying working with uGui + arduino to set Graphic on my display. Do you have any example with arduino? Just want to thank you for your effort and great framework that is easy to use but also very powerful. I am using it extensivly on STM32F429I-DISC1 board. thanks for the feedback! Kindly share some pictures of your projects! Hi, thanks for the library, but my buttons have no surrounding box. Can you tell me if there is a method I should call? Or is it something else? 1-High Right corner : shows the battery level. 3- In the middle : the main Menu, a dynamic Menu for configuration and showing the app features. Is there a way to draw a slash line (/) using the UG_DrawLine function? Is there any particular reason to keep this code? We are using uGui Library with BuyDisplays ER-TFT050-3 800×480 with OTA7001A LCD controller and STM32F4 platform . We are facing some flickering issues with current code. We think that the problem is with LTDC peripheral and SD-RAM configuration. Please see if there is any reference code or information available for this combination. Please share. 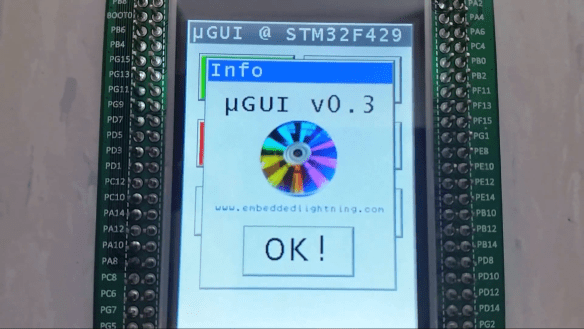 I have converted your uGUI Demo for the STM32F4 Discovery board using the 407 with LCD and Touch using the OpenSTM32 Workbench. If you are interested I can also post the source so that your uGUI tool can be easily used on this platform. Your Graphics library is clean, and easy to understand. Thank you for all your hard work. nice! Yes, please upload the project so that other guys in the forum can also use it. Great library! Unbelievably quick time to get it up and running on my Cypress PSoC4. Any chance you're planning on or are working on variable width fonts? uGUI actually supports variable width fonts via the "widths" array though there are no variable width fonts included with uGUI out the chute. I will use ugui in my project, "stm32f103 + freertos + ugui + lcd12864"
Can you please provide source code? thanks a lot for the positive feedback. Just come back in a few days please. Hello. Just found your library the other day. Love it due to the ease of porting and simplicity. Will likely never return to my old graphics library. I just can't figure out how to make two windows show, and get one inactive and one active. Could you please respond here or email me? thanks for your positive feedback! Can anybody please help him? I am completely new to this embedded system. I am trying to build a system that display the surrounding temperature in C or F , the user can select using a touch sensitive display. Components i am using is MAX31855 thermocople for temperature sensing. I have a Raspberry Pi 2 Model B at home i'm using. I have a C program to sense temperature from this chip. which i got from Github. I want a 3.5 to 5 inch touch display with hdmi connectivity so that i can use GPIO pins later in future for other purpose. I am getting confused as to how to proceed with this small project of mine. Which display to select? How to proceed with GUI programming using UGUI? I saw the reference guide but i'm totally new to this i'm getting extermely confused. could you please put up a demo video or a new page on the your website for beginners like me. yes, there will be a tutorial. Just come back here in a few weeks. I am using this GLCD(240×160) using st7586S driver. I have interfaced it via 4 wire SPI interface. I am able to init the GLCD and able to run command All Pixel ON, All Pixel OFF. but when i am writing data to DDRAM i am not abl to get anything on the display could you please help. could you please help in pointing out where i am doing wrong? sorry, but I don’t have the time to review your code right now. The only thing you need to do is to be able to toggle a single bit inside the display memory. After that the PSET-function will do the job. It's a nice work and thanks for sharing. I'd like to ask that is it possible to use uGUI with one of the Atmega ARM based MPUs that is AT91SAM9x35. It has own LCD controller and library but i did not figure out how to connect uGUI with this controller. I'll be glad if you have an idea or suggestion on this issue. it’s basically just one function that you need: PSET(). Please have a look at the reference manual. I use pic32mz with ili9341 and I would take advantage dma to accelerate. I am not able to exploit the DMA module, how can I do? I can have an example already tested? the GUI looks very nice and its look easy to implement it! Is the Projekt still allive ? I am searching for a library for my home project and my question is: It is useful to start with when the project seems to go on nothing more ? the project is still alive! Can this library be used if there is not enough RAM to hold the framebuffer? I'm looking at using an LCD that has a 8080 interface. Thanks! well, this depends on your display. The GRAM must be located either in the display or in the MCU. You can use µGUI in both cases. First, I would like to thank you for making this library available and, most importantly, the pdf for each function. Libraries for lcds, we have many online, more documented are few. However I noticed in the compilation that there were significant changes between the documentation and the v0.30 library in UGUI-master, to the point that the compilation after some adjustments in the example "uGui_STM32F429_Discovery" was running fine, and compilation with substitution by the files UGUI-master, have made so many mistakes that you want to be able to track. Whatever is possible, you could update your example with the files in UGUI-master, but keep the previous one so that you can understand the changes. I need to do some updates regarding GitHub. Will get back to you regarding this! Hi, I'm trying to setup an ST75256 based LCD display to a Raspberry Pi as 240×160 X-Windows active display. Is this possible and can you help me please? sorry, but I don’t have much time right now. Can anybody please help here? Very nice project. 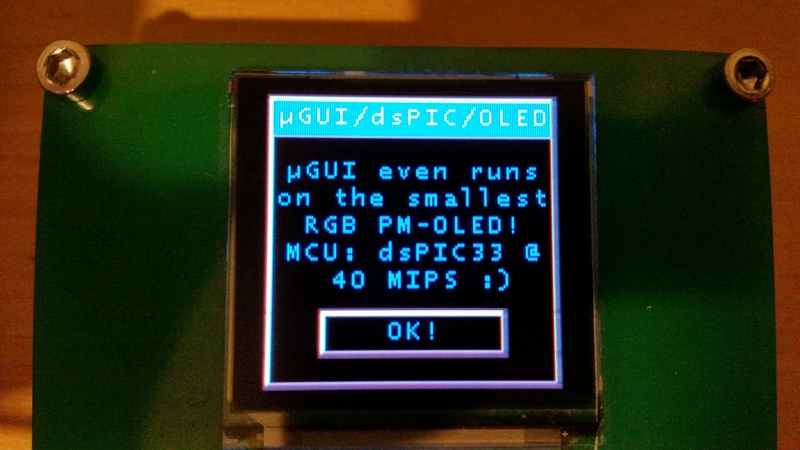 I've got an OLED display with SSD1322 controller and I was wondering if I can use your uGUI library on my STM32F407 connected to the LCD via the 8080 parallel interface through the FSMC peripheral. Have there been any updates to this project lately?